Capacity 200 Ltrs. - 5000 Ltrs. 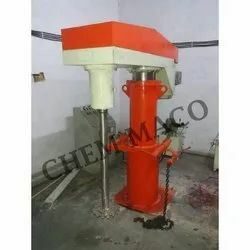 We manufacture High Speed Disperser (Hydraulic Lifting) with tank which is a highly versatile machine for the production of paints, inks, pharmaceuticals and other construction chemicals. This machine ensures proper breaking of agglomerates and can also mix various types of liquid in order to receive premium quality output.